A large fire broke out Wednesday at a residential construction site in Greenbelt, Maryland, consuming two rows of town houses and damaging a third row of occupied homes. WASHINGTON — A large fire broke out at a residential construction site near Greenbelt, Maryland, consuming two rows of town houses and damaging a third row of occupied condominiums, Prince George’s County Fire and Rescue Service spokesman Mark Brady said Wednesday. The fire broke out in a town house community on Dorsey Lane in Lanham at about 12:30 p.m. The occupied town houses were evacuated and Brady said, so far, there are no reports of any injuries. Brady tweeted videos Wednesday showing a partially collapsed building covered in flames, surrounding by billowing black smoke. A second row of town houses was “gutted by fire” but still standing, Brady said. The third row of completed brick town homes appeared to suffer “significant” damage, he said. Video Brady took showed melted siding and shutters. The town houses under construction did not yet have working sprinkler systems installed, Brady said. It’s believed the fire started in a four-story building. Construction equipment, lumber and a propane tanks helped fueled the fire, he said. Firefighters had the blaze under control by about 2:45 p.m. A total of 26 homes were displaced, Brady said, and the estimated fire loss is $8.9 million. 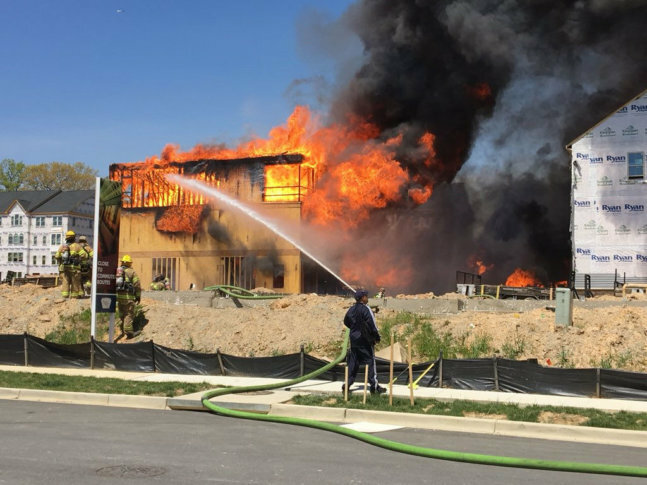 Fire crews in Northern Virginia also battled two large fires Wednesday afternoon, including a fire at the Forest Glen Senior Apartments in Centreville.